Resource Tuner Screenshots. 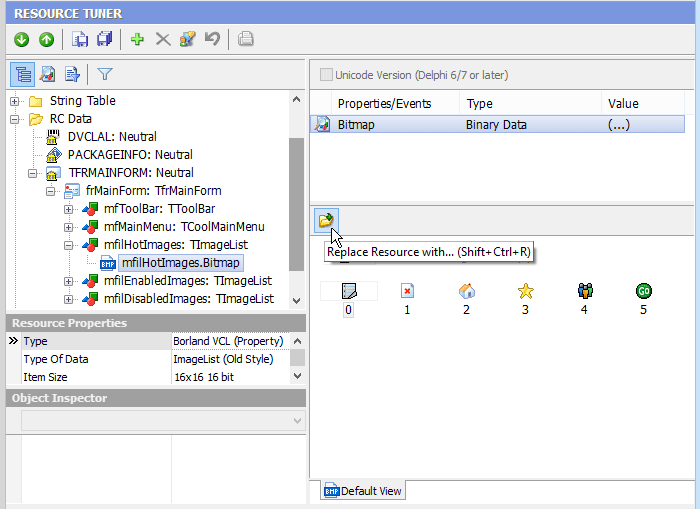 Open and edit EXE, DLL, OCX, SCR files with Resource Editor. The free products that I tried would not open the resources I was interested in. Plus, the UI is super easy to use. No muss, no fuss, no Visual Studio to crash my box. Keep up the good work. From the toolbar you can quickly save your changes, save or delete/restore a selected resource, copy a selected resource to the clipboard, add an item into the resource section, search through the resource tree (useful for searching RCData content), and see properties of a selected resource (Language ID, Type, Raw size, etc). 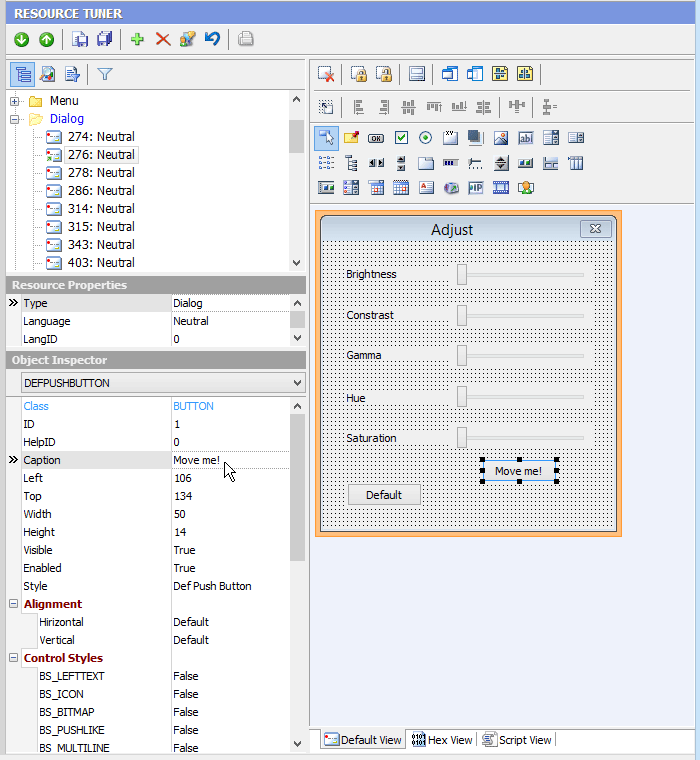 Navigate easily through the Delphi forms, RCData, and objects, and view their contents (Image Lists, Strings List, Glyphs, Bitmaps). There's a very strong emphasis on peeking inside Delphi applications and packages. The Log pane displays all the events and operations, event timestamps, and information about the headers of the file. When you open a file with Resource Tuner, the UPX Unpacker plug-in detects whether a file is packed with UPX, and if so, this file will be unpacked automatically. Resource Tuner automatically starts the appropriate editor mode (Text, Graphics, Dialog, Menu, DFM, Media or Version Info). That will allow you to view and edit resources in the most convenient and intuitive way. 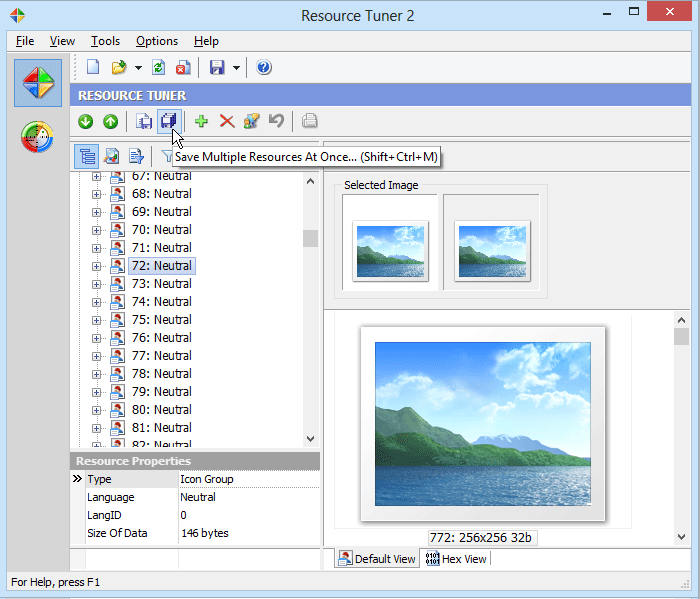 Resource Tuner supports viewing, adding and replacing large (256x256) Vista icons stored as PNGs. When editing dialogs, you will see a preview of what the dialog box looks like. 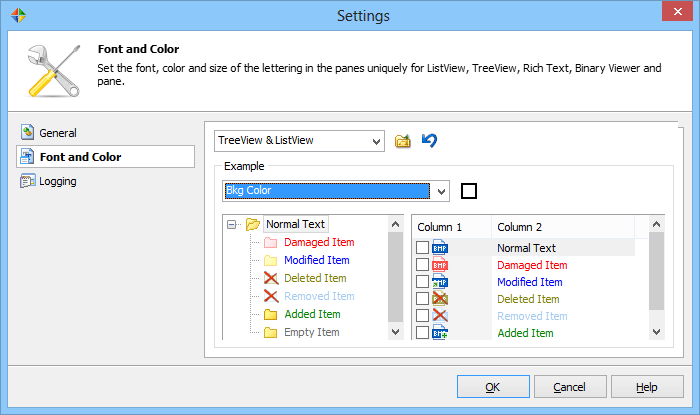 To see the script behind the dialog box that makes it work, select the Script View tab. 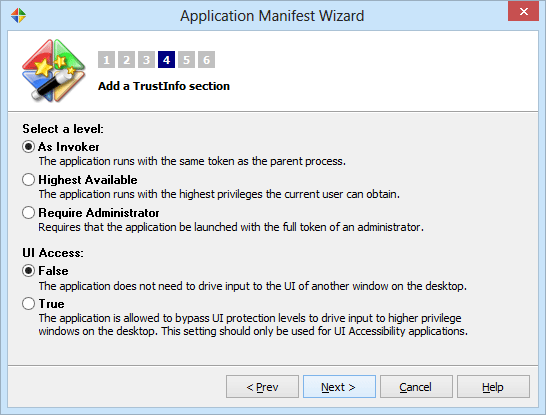 The Manifest Wizard helps you insert an application manifest into the resource section. It also will let you specially configure your Pre-Vista application to work with newer Windows versions, and mark it with a requested execution level. Selecting Settings from the Tools menu will display the Customization dialog. This displays a dialog box having three tabs, where you can customize the general, view and logging settings. Clicking on any tab will show the page of choices connected to that tab. Resource Tuner runs on all versions of Windows from 2000 through XP, Vista, 7, 8 and 10.